Walls, Turf, Green Roof, and Athletic Fields. 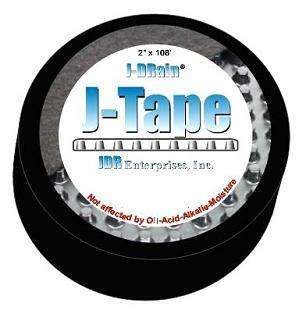 We carry all J-Drain products. J-Drain products provide protection for waterproofing systems and managing sub surface water around building foundations. Drainage systems can be used for many applications such as: commercial, residential, transportation, civic and environmental, athletic fields and turf, landscape, greenroofs and pipe protection. The search and need for an effective drainage system has always played a vital role in the construction industry. In the past, conventional crushed stone and perforated pipe has been used, but this system has several inherent limitations and shortcomings. 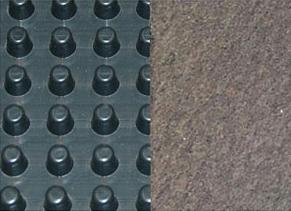 With the development of geosynthetic geotextile fabrics in the 1960's, the era of the prefabricated drainage system was born. If you don't see a specific part or product line. Please contact us for a special order. We will be sure to give you the best price available. 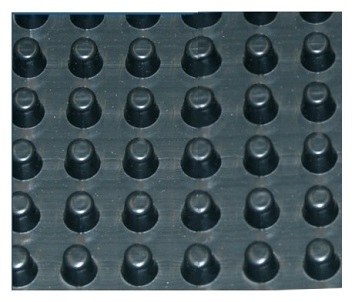 J-Drain 150 is a low profile choice for consisting of a light-duty impermeable polymeric sheet cuspated under heat and pressure to form a high-flow dimpled drainage core. The core is then bonded to a layer of non-woven filter fabric. The filter fabric retains soil or sand particles as well as freshly placed concrete or grout, allowing filtered water to pass into the drainage core. Limited to 20 feet of backfill. Consists of a light-duty impermeable polymeric sheet cuspated under heat and pressure to form a high-flow dimpled drainage core. The 200 series has a core that is then bonded to a layer of non-woven filter fabric. The filter fabric retains soil or sand particles as well as freshly placed concrete or grout, allowing filtered water to pass into the drainage core. Limited to 20 feet of backfill. 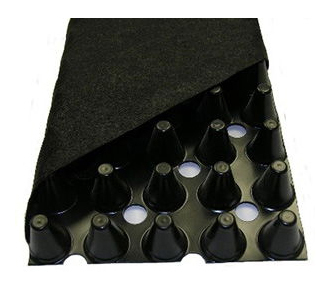 The identical properties as J-DRAIN 200 with the addition of a protection sheet bonded to the back side of the cuspated core providing protection for soft membrane waterproofing systems. J-DRAIN 220 is compatible with waterproofing systems without the use of a protection board. Limited to 20 feet of backfill. J-Drain 400 consists of a moderate-duty impermeable polymeric sheet cuspated under heat and pressure to form a high-flow dimpled drainage core. The core is then bonded to a layer of non-woven filter fabric. The filter fabric retains soil or sand particles as well as freshly placed concrete or grout, allowing filtered water to pass into the drainage core. With identical properties as J-DRAIN 400 and the addition of a protection sheet bonded to the backside of the cuspated core providing protection for soft membrane waterproofing systems, J-Drain 420 is compatible with waterproofing systems without the use of a protection board. J-Drain 700 consists of a heavy-duty impermeable polymeric sheet cuspated under heat and pressure to form a high-flow dimpled drainage core. The core is then bonded to a layer of woven filter fabric. The filter fabric retains soil or sand particles as well as freshly placed concrete or grout, allowing filtered water to pass into the drainage core. The identical properties as J-DRAIN 700 with the addition of a protection sheet bonded to the backside of the cuspated core providing protection for soft membrane waterproofing systems. J-DRAIN 720 is compatible with waterproofing without the use of a protection board. 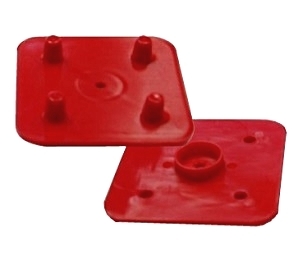 J-Drain 990 onsists of a heavy duty impermeable polypropylene sheet cuspated under heat and pressure to form a high flow dimpled drainage core. The drainage core is chemically resistant and designed for applications where chemical exposure is possible. 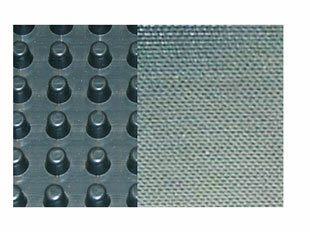 The core is then bonded to a layer of woven filter fabric. The filter fabric retains soil or sand particles as well as freshly placed concrete or grout, allowing filtered water to pass into the drainage core. J-Drain 300 consists of a heavy duty crush proof high density polyethylene geonet drainage core with its ridges heat fused to a layer of non-qoven filter fabric. 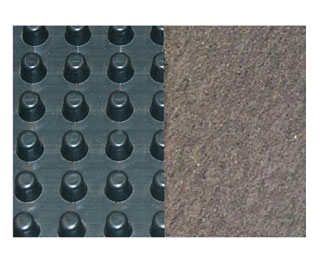 The filter fabric retains soil or sand particles as well as freshly placed concrete or grout, allowing filtered water to pass through to the drainage core. J-Drain 300 provides drainage from one side only. 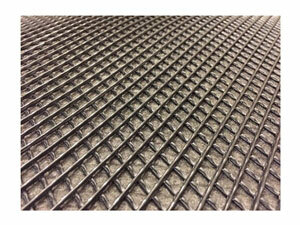 J-Drain 302 provides for two sided drainage with fabric on both sides for applications such as roadways. J-Drain 1000 is identical to J-DRAIN 300 in physical properties with the addition of a layer of heavy duty grey fabric bonded to the back side providing protectionand cushion for waterproofing systems requiring a added protection layer. The geonet drainage core is virtually crush proof, yet flexible enough to conform to irregular surfaces. Due to the crush proof nature, geonet drainage composites can be used in the most extreme cases with heavy loads and/or heavy vehicular traffic. GRS is a high strength pre-assembled drainage composite consisting of a dimpled core with root resistant ECO fabric attached to the top layer and geosynthetic fabric attached bottom. The ECO fabric prevents fine particles from being washed out and prevents roots from becoming saturated and affecting the efficiency of the drain layer.The dimpled core has water retention chambers for storing water while allowing excess water to pass through "perforation". 1 in. dimple height. 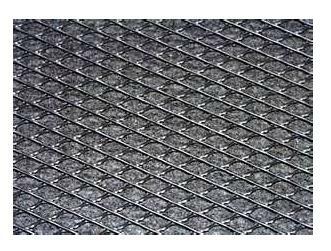 J-Drain GRS50 is a high strength pre-assembled drainage composite consisting of a perforated, dimpled core with root resistant ECO fabric attached to the top layer and geosynthetic fabric attached bottom. The dimpled core has water retention chambers for storing water while allowing excess water to pass through perforations. Similiar to GRS, except GRS50 has a smaller profile height (40 in). A modular composite drainage and collection system consisting of a 3-dimensional, high-flow, drainage core which is wrapped with a non-woven filter fabric. 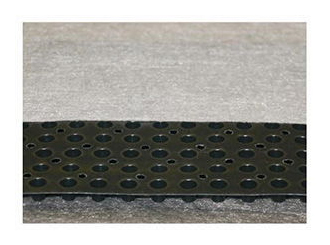 J-Drain SWD is available in 6,12,18, 24, & 36â€ widths. MVP-6 is well suited for providing easy to install trench drains by requiring only shallow, narrow trenches and eliminating gravel backfill. Used primarily in landscape, natural turf athletic fields, golf courses and many other applications. MVP-12 is placed horizontally across the synthetic turf fields and playgrounds and sloped to slideline trenches. The amount of gravel backfill is greatly reduced and elimnates trench excavation costs. Specialized PVC underground tape used to connect seams, overlaps, and connect J-Drain fittings. Will make watertight junctions and connections, providing super stretchability. Creates a firm hold for nailing and eliminates high stress points when used with J-Clips to hold and attach J-Drain products to walls or footers. Reduces damage to fabric during installation with a one piece design. Below is documentation for J-Drain products.